Board means the Judicial Conduct Board. Board Complaint is the document setting forth the formal charges and filed by the Board to initiate proceedings in the Court of Judicial Discipline. Board Counsel means any lawyer hired by the Board as staff counsel, including Chief Counsel, or any lawyer appointed as special counsel, to perform those duties as directed by the Board. Chief Counsel is the lawyer in charge of the screening and investigation of complaints, the prosecution of formal charges, and the performance of other duties as directed by the Board. Chair means the Chair of the Board or a member authorized to act on the Chair’s behalf. 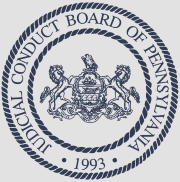 Complaint means a document setting forth information alleging conduct within the jurisdiction of the Judicial Conduct Board pursuant to Pa. Const. Art. V, § 18. Court means the Court of Judicial Discipline. Dismissal is a Board determination which terminates a case against a Judicial Officer. Judicial Officer includes magisterial district judges, judges of the Philadelphia Municipal and Traffic Courts, judges of the Pittsburgh Magistrates Court, judges of the Common Pleas, Commonwealth, and Superior Courts, and Justices of the Supreme Court. Probable Cause to File Formal Charges means probable cause to believe that conduct by a Judicial Officer has occurred for which a Judicial Officer should be suspended, removed from office, or otherwise disciplined pursuant to Pa. Const. Art. V, § 18(d)(1). Rules of Professional Conduct means rules of professional responsibility for attorneys. Staff includes employees of the Board and persons retained or appointed by the Board, or individual Board members’ employees when engaged in the business of the Board. Verification is a written statement of fact by the signer, supported by oath or affirmation or made subject to the penalties of 18 Pa.C.S. § 4904 relating to unsworn falsification to authorities. Adopted March 20, 1995, imd. effective. Amended Jan. 6, 2005, effective Jan. 29, 2005. So in original; there is no subd. (B). (1) Words in the singular number include the plural, and words in the plural include the singular. (2) The word “person” shall include corporations, societies, associations, partnerships, and organizations. (3) “Shall” is mandatory and “may” is permissive. (4) “Knowingly” includes reckless disregard for the truth or falsity of a statement. (B) These rules shall be construed to secure just and reliable determinations of probable cause in all matters considered by the Board. (C) An error or defect of procedure shall not confer any substantive rights on any party. Adopted March 20, 1995, imd. effective. Amended April 22, 1996, imd. effective. (A) These rules shall govern the conduct of all Judicial Conduct Board proceedings. (B) The Board shall receive and investigate complaints concerning judicial conduct filed by individuals or initiated by the Board, including allegations that a Judicial Officer has violated the Rules of Professional Conduct. (3) the conduct of the magisterial district judge is not likely to result in disbarment or suspension of the right to practice law. (A) The Board shall meet periodically as determined by the Board. Meetings other than periodic meetings may be called by the Chair on the Chair’s own motion, and shall be called by the Chair upon the written request of five members of the Board. (B) At the first meeting of each calendar year, the Board shall elect a member to serve as Chair, a member to serve as Vice-Chair, and a member to serve as Secretary. The Vice-Chair shall perform the duties of the Chair whenever the Chair is absent or unable to act. (C) The Chair may appoint a Board member, who shall be a judge or lawyer, to rule on all evidentiary issues and objections. Adopted March 20, 1995, imd. effective. (A) The Board shall appoint an attorney to serve as Chief Counsel, who shall not engage in the practice of law except as authorized by the Board, and who shall not serve in a judicial capacity. (B) Chief Counsel shall investigate and present to the Board any matters within the Board’s jurisdiction and shall perform other duties as the Board may direct. (C) The Board may hire staff counsel and appoint special counsel to perform duties as the Board may direct. (A) The Board shall have a seal. (B) The seal shall contain the words “Judicial Conduct Board of Pennsylvania” on the 7 upper circle and the word “1993” on the lower area circling arms similar to those appearing on the state seal. (C) Chief Counsel shall retain the seal and affix it to appropriate documents. (A) The Chair may appoint a Panel to take testimony and to summarize that testimony in a report to the Board. (B) A Panel shall consist of at least three members of the Board, one of whom shall be a lawyer and one of whom shall be a non-lawyer elector. (1) The rules may only be amended or rescinded, or new rules adopted, by the affirmative vote of a majority of the members of the Board. (2) Notice of any Board action on these rules shall be given to all members of the Board at least 30 days before the meeting at which such action will be taken, unless the time period is shortened by unanimous vote of the Board. (B) Publication of Proposed Changes. (1) Except as provided in paragraph (B)(2), any proposed change to these rules shall be forwarded to the Pennsylvania Bulletin for publication with a notice requesting comment. (2) A proposed rule change may be promulgated without publication where exigent circumstances require the immediate adoption of the proposal or where the proposed change is of a typographical or perfunctory nature. (C) Adoption. These rules and any subsequent changes to them shall be available for public inspection upon adoption and shall be forwarded to the Legislative Reference Bureau for publication in the Pennsylvania Bulletin. A quorum is a majority of the members of the Board. No member of the Board shall participate in a proceeding in which the member is a complainant, the subject of the complaint, a party, or a material witness. (A) The affirmative vote of a majority of the members of the Board eligible to vote shall be required for the dismissal of a complaint or the filing of formal charges with the Court of Judicial Discipline. (B) Except as provided in paragraph (A), Board decisions concerning all other actions and business of the Board shall be made by the affirmative vote of a majority of the Board members present at the meeting where the vote is taken. (C) The affirmative vote of a majority of the members of the Board shall be required to change the Rules of Procedure. (A) The Board shall keep a record of all proceedings concerning a Judicial Officer. (B) Chief Counsel shall be the official custodian of Board records and shall maintain them in accordance with retention policies adopted by the Board. (A) The Board may direct Chief Counsel to file with the Court a motion for the interim suspension of a Judicial Officer, with or without pay, following the filing of a Board Complaint or when an indictment or information charging the Judicial Officer with a felony has been filed. (B) The motion for interim suspension shall be promptly served upon the Judicial Officer and the matter shall proceed as provided in the rules of procedure governing the Court of Judicial Discipline. (A) Whenever the Board becomes aware of an indictment or information charging a felony against a Judicial Officer, the Board may file appropriate notice with the Court of Judicial Discipline. (B) Whenever the Board becomes aware of information related to a Judicial Officer which may, as provided by law, require or permit the exercise of the Supreme Court’s inherent power over the unified judicial system, the Board may file appropriate notice with the Supreme Court. (C) Whenever the Board becomes aware of information related to a Judicial Officer which may, as provided by law, require or permit the exercise of a president judge’s supervisory or administrative power over a Judicial Officer, the Board may provide appropriate notice to the president judge. Official Note: Paragraph (C) allows appropriate notice to a president judge if the Board becomes aware of information that may permit the exercise of a president judge’s exercise of supervisory or administrative power over a Judicial Officer. Such authority is currently found in Rule 14 in relation to the Supreme Court’s inherent power over the unified judicial system generally. The Board has concluded that this limited authority to disclose information does not adequately address all situations that confront the Board during investigations, and, consistent with the Board’s constitutional obligation to keep matters confidential, believes this amendment allows for an additional avenue of limited disclosure of otherwise non-public information in appropriate circumstances. The authority of president judges is not well-defined. President judges and their authority are provided for in the Constitution of Pennsylvania, the Judicial Code, and the Rules of Judicial Administration. The Chief Justice and president judges of all courts with seven or less judges shall be the justice or judge longest in continuous service on their respective courts; and in the event of his resignation from this position the justice or judge next longest in continuous service shall be the Chief Justice or president judge. The president judges of all other courts shall be selected for five-year terms by the members of their respective courts, except that the president judge of the traffic court in the City of Philadelphia shall be appointed by the Governor. A chief justice or president judge may resign such position and remain a member of the court. In the event of a tie vote for office of president judge in a court which elects its president judge, the Supreme Court shall appoint as president judge one of the judges receiving the highest number of votes. Pa. Const., art. V, § 18(d). As is readily apparent, the Constitution does not specify the powers or authority of president judges. (a) General rule.–The Chief Justice of Pennsylvania and the president judges of all courts with seven or less judges shall be the judge longest in continuous service on their respective courts. In the event of his resignation from this position the judge next longest in continuous service shall be the Chief Justice of Pennsylvania or the president judge. Should any two or more judges of the same court assume office at the same time, they shall cast lots forthwith for priority of commission, and certify the results to the Governor who shall issue their commissions accordingly. (b) Courts of eight or more judges.–The president judges of all courts with eight or more judges shall be selected for five-year terms by the members of their respective courts. In the event of a tie vote for the office of president judge, the Supreme Court shall appoint as president judge one of the judges receiving the highest number of votes. (1) Be the executive and administrative head of the court, supervise the judicial business of the court, promulgate all administrative rules and regulations, make all judicial assignments, and assign and reassign among the personnel of the court available chambers and other physical facilities. (2) Exercise the powers of the court under section 2301(a)(2) (relating to appointment of personnel). (2) Court may appoint and fix the compensation and duties of necessary administrative staff and fix the compensation of personal staff. (6) Temporary Assignments: Transfer of Cases—In consultation with the affected magisterial district judge(s), the president judge may order temporary assignments of magisterial district judges or reassignment of cases or certain classes of cases to other magisterial districts within the judicial district or to central courts within the judicial district. (7) Conduct of Magisterial District Judges—When a complaint is received with respect to the conduct of a magisterial district judge, the president judge may, in his or her discretion, review the matter with the affected magisterial district judge and take any action the president judge deems appropriate to assure the efficient administration of justice including, where warranted, informing the appropriate disciplinary authority. Contemporaneous notice of any such action taken by the president judge resulting in reassignment of cases or otherwise affecting the duties of the magisterial district judge shall be given to the Supreme Court of Pennsylvania and the Court Administrator of Pennsylvania. Pa. R.J.A. No. 605 (emphasis added). The text of this rule is taken from Rule 17 of the Rules Governing Standards of Conduct for Magisterial District Judges, rescinded March 26, 2015, effective immediately. This rule recognizes that magisterial district judges are the judicial officials charged with the legal and administrative responsibilities within their respective magisterial districts. Designed to further the efficient and effective administration of justice in the unified judicial system, this Rule contemplates a cooperative approach to the administration of the magisterial district courts, acknowledging judicial independence and the supervisory role of the president judges. Rule 17 was amended in 2003 to more specifically outline the authority, powers, and responsibilities of the president judges with regard to management of the magisterial district judge system. In so doing, however, it was not intended that this be an exclusive list of powers and responsibilities, nor was it intended to limit the president judges’ authority to the areas listed. . . . Nothing in paragraph (B)(7) is intended to contradict or circumvent the constitutionally established process for the suspension, removal, and discipline of magisterial district judges. See Pa. Const. art. V § 18; see also 207 Pa. Code Part III (Judicial Conduct Board Rules of Procedure) and Part IV (Court of Judicial Discipline Rules of Procedure). President judges do not have authority to suspend or discipline magisterial district judges. Pa. R.J.A. No. 605, Note (emphasis added). Other provisions of the Rules of Judicial Administration provide for the authority of president judges within their judicial districts. See, e.g., Rule 701(C) (relating to request for assignment of additional magisterial district judges or judges); Rule 702 (relating to divisional assignments of judges); Rule 703 (relating to reports of judges); Rule 704 (relating to judicial leave); and Rule 706 (relating to determination or selection of Chief Justice and president and administrative judges). Given the administrative and supervisory authority of president judges over the Judicial Officers of the judicial district, it is sometimes appropriate to inform the president judge of on-going Board matters so that the president judge may appropriately exercise his or her administrative or supervisory authority. For example, if a judge within the district is under investigation for alleged mistreatment of judicial staff, it would be appropriate for the Board to so inform the president judge so that he or she might make staff adjustments during the pendency of the Board’s investigation. There may be some circumstances in which adjustments to assignments of the judge under investigation may be warranted. Presently, there is no mechanism, in light of the non-public nature of the Board’s investigative activity, by which to properly communicate these matters to the president judge. While the Supreme Court has ultimate supervisory and administrative authority over all courts, in some matters, notice to the Supreme Court may be ineffectual to be able to deal with the immediate problem at hand. Amended April 4, 2016, imd. effective. Except where the Board determines otherwise for good cause, the Board shall not consider complaints arising from acts or omissions occurring more than four years prior to the date of the complaint, provided, however, that when the last episode of an alleged pattern of recurring judicial misconduct arises within the four-year period, the Board may consider all prior acts or omissions related to such an alleged pattern of conduct. (A) Rescinded February 5, 2007, immediately effective. (B) If, within two years of a Board dismissal, additional complaints are filed alleging similar conduct, the Board may direct that the original allegations be reinvestigated. (C) At any time after a Board dismissal, if it becomes known that the Judicial Officer knowingly made a material misrepresentation of fact, or knowingly concealed evidence or otherwise obstructed a Board investigation, the Board may direct that the allegations in the complaint be reinvestigated. Except as provided in Rule 18, all information and proceedings relating to a complaint and records of the Board’s deliberations shall be confidential. (1) A Judicial Officer who is the subject of a complaint made pursuant to these rules may request in writing that the matter be made public, or may waive confidentiality for a particular purpose specified in writing. (2) Upon receipt of a written request or waiver pursuant to paragraph (A)(1) or (B), the Board may make those disclosures it deems appropriate. (4) to provide the Judicial Officer’s response to the complaint. (C) Information related to violations of criminal laws may be disclosed to the 11 appropriate governmental agency. (D) Information related to violations of rules of professional conduct may be disclosed to the appropriate agency. (B), the Board may issue a statement that the matter has been dismissed. (4) law enforcement agencies investigating qualifications for government employment. (G) Review. If the Chair makes a determination pursuant to paragraph (B) not to disclose information, that determination shall be reviewed by the Board at the request of the Judicial Officer. (H) Work Product. Board Counsel’s work product and the investigative files shall not be disclosed unless disclosure is required by these rules. (A) Members of the Board, Board Counsel, and Staff shall be absolutely immune from suit for all conduct in the course of their official duties. (B) All communications to the Board, a Panel, or Board Counsel, relating to conduct for which a Judicial Officer could be suspended, removed from office, or otherwise disciplined pursuant to Pa. Const. Art. V, § 18(d)(1), and all testimony given in a proceeding conducted pursuant to these rules, shall be absolutely privileged, and the person making the communication or giving the testimony shall be immune from suit based upon such communication or testimony, except that such immunity shall not extend to any action that violates Rule 17 (Confidentiality). (A) Counsel for a Judicial Officer shall file an entry of appearance with Chief Counsel. (B) The entry of appearance shall include counsel’s name, address, phone number, and Pennsylvania Supreme Court Identification Number. (2) any process providing restricted delivery to and returned receipt from the named addressee. (B) Whenever counsel enters an appearance pursuant to Rule 20, service shall be made on counsel, and may be made by first class mail. (C) In appropriate circumstances, the Chair may authorize any other method of service reasonably designed to accomplish service, including service to a Judicial Officer’s last known address. (A) All testimony presented to the Board shall be taken under oath or affirmation administered by any member of the Board, by Chief Counsel, or by any other person authorized by law. (B) A contemporaneous verbatim record of all testimony shall be made and preserved. (C) The Board may permit testimony to be submitted by affidavit. Upon request of the Judicial Officer or Board Counsel, after notice to the opposing party, the Chair may permit the deposition of any witness who may be unavailable to testify at any proceeding. The deposed testimony shall be taken and preserved pursuant to Rule 22 (A) and (B). (A) The Board, by its Chair, the Chair’s designee, or Chief Counsel, may issue subpoenas to compel the testimony under oath of witnesses, including the Judicial Officer who is the subject of a complaint, and to compel the production of relevant documents, books, accounts, and other records. (1) The subpoena shall indicate on its face that it is issued in connection with a confidential proceeding of the Judicial Conduct Board. (2) The subpoena shall give notice that it shall not be a breach of confidentiality for a subpoenaed person to consult with an attorney or to provide notice as required by law. (3) The subpoena shall order the witness to appear before person or persons named at a specified date, time, and place, and to bring any items described. (D) Challenges. Any challenge to the validity of a subpoena shall be decided by a member or members of the Board appointed by the Chair. (E) Enforcement. The Board, by its Chair or the Chair’s designee, may enforce a subpoena by initiating proceedings in the Commonwealth Court pursuant to 42 Pa.C.S. § 761(a)(2). (A) When the Board receives information that a Judicial Officer may be subject to sanction pursuant to Pa. Const. Art. V, § 18, the Board shall refer the matter to Chief Counsel. (e) the name and address of the complainant’s lawyer, if any. (2) When the Board receives information from any other source, if Chief Counsel concludes that the matter should be investigated, Chief Counsel shall prepare a written complaint and notify the Board at its next periodic meeting. (A) Board Counsel may conduct interviews and examine evidence to determine whether grounds exist to believe the allegations in the information received. (1) If Chief Counsel determines that the person against whom a complaint has been filed is not within the jurisdiction of the Board, Chief Counsel shall notify the complainant, and refer the complainant to the agency having jurisdiction, where appropriate. (2) If Chief Counsel determines that the Board has jurisdiction, Chief Counsel shall submit the complaint for preliminary Board review. (C) defer action during the pendency of a criminal matter, if appropriate. (E) refer the matter to another agency. The Board’s decision shall be in writing and made part of the record. Action taken by a Judicial Officer in reliance on and pursuant to a written advisory opinion by the Ethics Committee of the Pennsylvania Conference of State Trial Judges, or by the Ethics and Professionalism Committee of the Special Court Judges 16 Association of Pennsylvania, as long as that opinion was issued before the conduct occurred, shall be considered by the Board in making a determination under these rules, but such advisory opinions shall not be binding on the Board. (A) Notice of Dismissals or Referrals. (1) If the Board dismisses a complaint or refers the matter to another agency, the Board may notify the complainant. (2) If the Judicial Officer has become aware of the complaint and notifies the Board, or if the matter has become public information, the Board may notify the Judicial Officer of the dismissal or the referral to another agency. (B) Notice to Judicial Officer of Investigation. (1) Promptly after a Board decision to proceed with a full investigation, the Board shall notify the Judicial Officer that an investigation by the Board will be conducted. (f) at the discretion of the Board, the identity of the complainant. In any case in which the allegations involve a Judicial Officer’s mental disability, the Board may petition the Court to appoint a lawyer to represent the Judicial Officer if the Judicial Officer is without representation. The Board may require a physical, psychiatric, or psychological examination of the Judicial Officer, and may appoint one or more professionals to make an examination and prepare a report, a copy of which shall be given to the Judicial Officer. The Judicial Officer’s unjustified failure to submit to a physical, psychiatric, or psychological examination required by the Board may be considered as evidence of physical or mental disability. (A) If the Board finds probable cause to file a Board Complaint alleging mental or physical disability, the Board shall promptly notify the Judicial Officer and provide the Judicial Officer with an opportunity to resign from judicial office or, when appropriate, to enter a rehabilitation program acceptable to the Board prior to the filing of the Board Complaint. (3) when determined necessary by the Board, agrees to a voluntary suspension of some or all of the Judicial Officer’s duties. (2) continue the matter pending a reevaluation after a period of judicial service specified by the Board. (4) upon application of the judicial officer, the Board may approve an appropriate treatment program. (B) Rescinded February 5, 2007, immediately effective. Adopted April 20, 1998, imd. effective. The Judicial Conduct Board recognizes that the judiciary, like the general population, includes individuals impaired by substance abuse1. Because judges exercise a unique public trust, the Judicial Conduct Board, in devising its rehabilitative diversion procedure, desires to encourage affected members of the judiciary to seek help at the earliest possible moment so as to ensure maximum protection to the public against misconduct resulting from their impairment. The Board seeks to achieve this objective through a realistic plan to mitigate the harmful consequences of substance abuse to the judiciary and the public. The primary function of this Policy is the rehabilitation of the judge; a secondary modality is the prompt disposition of substance abuse related complaints, obviating costly and time consuming investigations, hearings and related proceedings. The Judicial Conduct Board regards substance abuse as an illness and will regard misconduct caused by such an illness as mitigated by that fact, provided that the impaired judge obtains appropriate treatment for his/her problem. The Board encourages President Judges and administrative agencies to accommodate rehabilitation by any impaired judicial officer, provided that the President Judge and appropriate administrative agency have been made aware of the judge’s condition and the accommodations sought by the judge do not impose an undue hardship on the court or agency. This Policy is not intended to provide that substance abuse problems are an excuse for deficiencies in performance or behavior. Judges with substance abuse problems will be held to the same standards as other similarly situated individuals. The Judicial Conduct Board is committed to preserving the independence and integrity of the judiciary and assisting the recovery of judges suffering from substance abuse. It is the purpose of this Policy to encourage those judges who desire to seek help to do so at an early stage before their functioning or the judiciary itself is compromised. The impairment of any judge’s performance due to substance abuse may have an adverse impact on the court’s functioning. For this reason, it is important for a judge with a substance abuse problem to seek help as early as possible. Possession or consumption of alcohol or other mood-changing chemicals while on court property or while performing judicial services constitutes misconduct on the part of a judge. Reporting to or remaining at the workplace under the influence of alcohol or other mood-altering drugs, is likewise regarded as misconduct. This prohibition does not apply to limited alcohol consumption at meals off of the court premises. The sale, manufacture, delivery, distribution, possession, processing, packaging, or otherwise trafficking, of controlled substances is a crime under the Drug, Device and Cosmetic Act of April 14, 1972, P.L. 233 No. 64 (35 Pa.C.S.A. § 780-101 et seq.) and any judicial officer found guilty of such conduct shall be ineligible for the diversionary treatment described in this policy. Any judicial officer convicted of Driving Under the Influence of alcohol or any controlled substance as defined in the Vehicle Code Act of 1976, June 17, P.L. 162 No. 81 § 1, as amended (75 Pa.C.S.A. § 3731) or granted Accelerated Rehabilitation Disposition (“ARD”) on a charge, will be subject to discipline for such misconduct but such Judicial Officer may seek mitigation of any otherwise applicable sanctions so long as he/she cooperates in an approved treatment program described in this policy. For the purpose of the Board’s diversion program, a Qualified Treatment Program shall be one which is approved by both the Administrative Office of Pennsylvania Courts (AOPC) and this Board. (A) When the Board finds probable cause to investigate a Complaint alleging misconduct involving substance abuse, the Board may notify the Judicial Officer of its investigation and provide the Judicial Officer with an opportunity to petition the Board for permission to enter a rehabilitative diversion program acceptable to the Board prior to the filing of formal charges with the Court of Judicial Discipline. (B) Such petition shall be filed with the Board promptly. Absent Board approval, a petition shall not be considered if filed after the Judicial Officer’s response to the Board’s Notice of Full Investigation (see Rules of Procedure of the Judicial Conduct Board outlined in Rule 30B). (5) the Judicial Officer’s consent to submit to testing for drug or alcohol consumption 21 during any probationary period later imposed. Adopted March 21, 2003, effective March 22, 2003. (A) When any Judicial Officer under investigation applies for diversion under Rule 36 on the ground of his or her substance abuse, the Board may require the applicant to submit to such medical evaluations as it deems necessary. The Board shall appoint one or more healthcare professionals to examine the applicant and report their findings to the Board. A copy of any such report will be shared with the applicant. Failure to submit to examination will be considered by the Board in its disposition of any pending complaint. (B) All expenses incurred for such evaluations and reports shall be assessed against the Judicial Officer and shall be his or her sole responsibility. (A) When a Judicial Officer enters a rehabilitation diversion program pursuant to this Chapter, the Board may defer filing formal charges with the Court of Judicial Discipline for a reasonable period of time to permit the completion of the program, provided that the Judicial Officer consents in writing to the release of treatment information and records relating to his or her participation in the program. (B) When a Judicial Officer satisfactorily completes an approved inpatient rehabilitation program, the Board shall continue the matter for a twelve (12) month probationary period, which may be conditioned on the Officer’s continued participation in a recommended recovery program. (C) Rescinded February 5, 2007, immediately effective. substance abuse – repeated excessive use of alcohol or other drugs which continues to cause serious adverse consequences in one’s life. alcoholism and other chemical dependency – a pattern of chronic, harmful and compulsive substance abuse characterized by denial and impaired control over the use of the substance. As used in the Policy and Chapter 11 of the Rules of Procedure of the Judicial Conduct Board, the term substance abuse shall include alcoholism and other chemical dependency as well as substance abuse.